Willem Dolphyn is born May 17th 1935 in Antwerp, Belgium where he grew up as an only child in an exceptional artistic environment. His father Victor was painter as well, and professor at the Royal Academy of Arts in Antwerp. 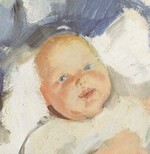 The baby's head opposite this text is a detail of the painting "Willem in his cod", painted by Victor. His mother Anna De Ridder was one of the daughters of Alfons De Ridder - writer Willem Elsschot. The Dolphyn household was frequently visited by artistic friends and acquintances with whom they had endless discussions about art. All this had a huge influence on Willem's future as an artist. Witness of all this is a drawing of 2 swans Willem made at the age of 4, after a visit to the Antwerp Zoo . Unfortunately, the original drawing got lost over the years. During the difficult years of war, Willem continues to draw, under influence of the coming and going of soldiers, tanks, and planes. He draws pages full of warscenes, incredibly detailed, which everyone thought of as amazing. After the war, it is time to make some serious decisions about his future. After a couple of years at the Atheneum, and an unsuccesful attempt in a business and administration school, he finally attends the Royal Academy of Arts in Antwerp. He is thought by Karl De Rover, Antoon Marstboom, J. Creytens... supplemented with private lessons from father Victor. As youngest pupil ever, he was accepted at the National Higher Institute for Fine Arts in Antwerp in 1952. In the beginning, Willem lived on the earnings of book illuminations and all kinds of illustrations, such as logo's, cartoons, stamps, beer mats and comic strips. Meanwhile, he kept aiming for a fulltime career as a painter. Without hesitation, Willem chooses for the "classic" realism, unlike lots of contemporaries who skim all kinds of "isms" of art. In 1968, he obtains his first succes with a solo exhibition in Antwerp. 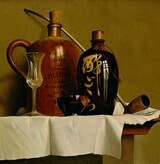 But to ensure a certain income, he works as well as a teacher at the Art Academies of Mol and Berchem (Belgium). The quality of Willem's paintings make people forget all negative connotations of the word "classic". The carefully chosen objects, the balanced compositions, the subtile game of light and dark, of shadow and colour, and above all, the life-like reproduction of the textures are all extremely taken care of and executed in the technique of the 17th century painters.